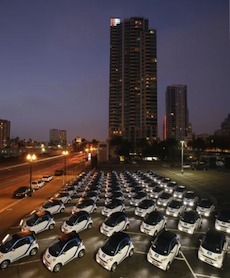 On November 18th, a fleet of 300 emissions-free Smart car cars hit the road in San Diego, marking the first day of North America’s first all-electric vehicle sharing program. The company behind the car-sharing network, Car2Go, already has car sharing programs in Vancouver, Texas, Hamburg, and Ulm, but the new San Diego network is the first time it has launched a fleet of entirely electric vehicles. In order to make its electric car sharing program as accessible as possible for residents, Car2Go has implemented a “free-floating” service model. This model allows residents to use the cars as long as they want without being restricted to dropping off the vehicles at a given place or time. Instead, when the driver is finished, he or she simply drops the vehicle off at a designated Car2Go spot, at non-restricted parking metres, or in any residential area within Car2Go’s operating area. Reservations are not required and the vehicles can be accessed 24 hour a day. Driving one of Car2Go’s Smart FourTwo electric vehicles costs 35 cents per minute, 12.99 per hour, or $65.99 per day. Right now the company is waiving the initial $35 membership fee and providing new registrants with 30 minutes of free driving. The company also hopes to complement the city’s public transportation system, by bridging the gaps commuters experience in the “first and last mile” of a public transit commute. Achieving sustainable urban transportation has emerged as a pressing issue for cities. France has already launched an electric vehicle sharing program of its own and electric vehicle infrastructure has been popping up in cities around the world. With city life becoming a reality for an increasing share of the world’s population, we need to consider how we can limit the environmental degradation associated with urban expansion. Although electric-vehicle sharing programs are a solid first step in implementing sustainable urban transportation, ensuring their success requires support from government policies and a willing-embrace by urban residents.